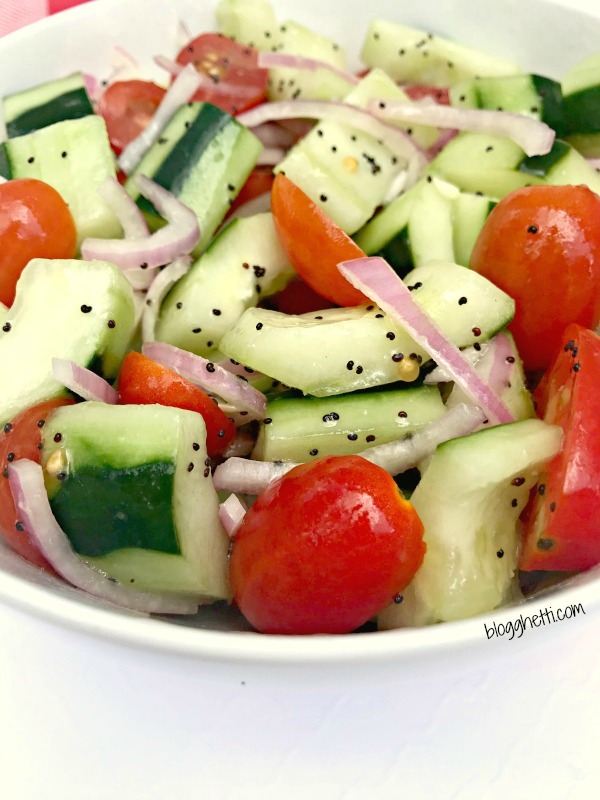 Cucumber Tomato Salad with lemon poppy seed dressing is a simple and delicious salad, perfect for lunch or with dinner. It’s a great way to keep summer food flavors going into fall. Welcome to the Sepetember Pinterest Challenge Blog Hop! The purpose of this Pinterest Challenge is to motivate all the participants of this hop (and you too) to not just pin, but to make it happen! So this month, I chose to make a Cucumber Tomato Salad with a Lemon Poppy Seed Dressing from this pin. The recipe is from The Slow Roasted Italian and her site is amazing. Previously, I have tried (with great success) these pins: Tex-Mex Chicken Foil Packets, Homemade Banana Cream Pie and Kielbasa, Peppers, and Potato Hash. 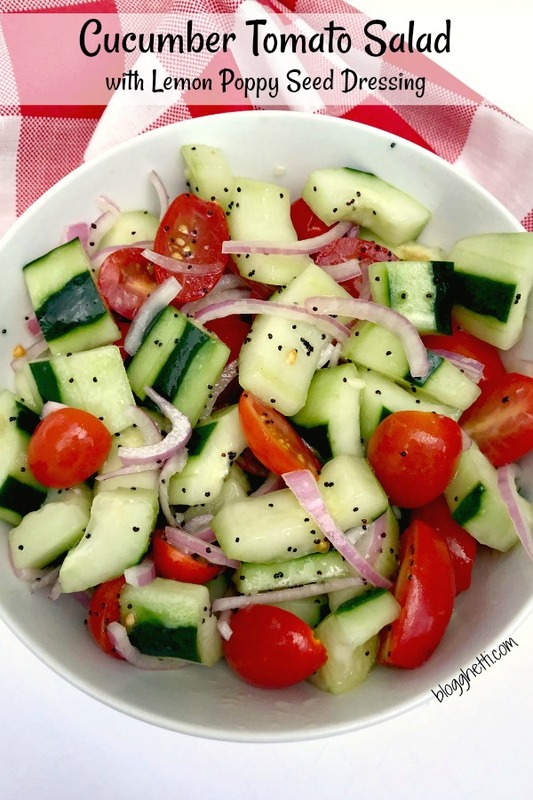 I absolutely love salads with cucumbers, and could eat the vegetable on its own all day long. My favorite thing about this recipe is the lemon dressing with the poppy seeds. When I saw this recipe on Pinterest, it was a no-brainer for me to make this, and hope that no one else in the family would want me to share. Well, they did want me to share (darn! ), so I just made the salad again the next day and it, too was gone in a flash! It’s that good, ya’ll! If I’m being honest here, I wanted to add some fresh corn to this salad because it’s a thing and I had a couple of ears to use up. Well, I waited too long and the corn just wasn’t fresh enough for the salad. So, no corn. BUT, it would have been so good in this! 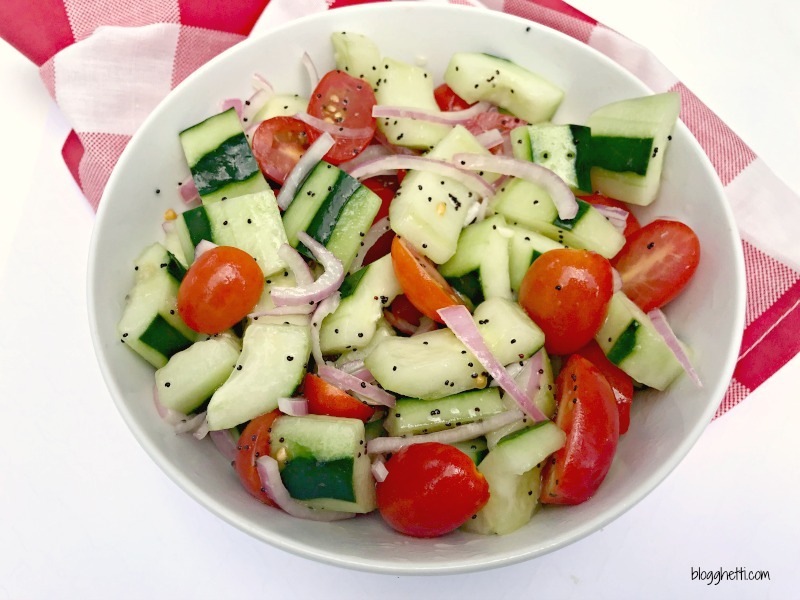 Cucumber Tomato Salad with lemon poppy seed dressing is a simple and delicious salad, perfect for lunch or with dinner. It's a great way to keep summer food flavors going into fall. In a large bowl, combine lemon juice, sugar, olive oil, poppy seeds, mustard, garlic, salt, and onion powder. Whisk until dressing is completely combined. Add cucumbers, tomatoes, and onion to the bowl, and toss with the dressing until it's all combined. I love salads like this! Sounds really yummy. This is one of my favorite salads. This looks delicious! This looks amazing and I agree is a great way to use the vegetables from the garden, my husband will love this! And, it’s super easy to make! Wow! We usually use a plain vinaigrette when making this salad but will definitely mix it up with your dressing next time I make it. yes, do try this one next time. The flavors just pop more with the lemon. That looks delicious! There is nothing quite like garden fresh cucumbers mixed with tomatoes. YUM. Pinned. Thanks for pinning! I agree…fresh garden veggies are the best! This salad looks so good. I bet the lemon poppy seed dressing is delicious. I love the normal vinaigrette dressing for this salad but the lemon and poppy seed just made the salad pop even more with flavor. I’m in Greece and for lunch today had a fabulous cucumber salad! What perfect timing. I like the idea of poppyseed dressing and will have to try out your recipe. What a great warm weather salad! Pinning! This salad sounds so refreshing and it’s making my mouth water. I can see why you wanted to make this. Yummy! I bet feta cheese would work good in this salad, too. The dressing sounds good. Never had a dressing with poppy seeds in it. We love tomato and cucumber salads and this twist on the dressing sounds delicious! It’s such a nice way to stretch a little more summertime goodness into September. I have everything I need and am going to make a bowl right now! I love cucumbers and tomatoes! I need to try this recipe one day. My favourite combination for a salad, but I haven’t tried it adding this kind of dressing, sounds delicous!